THE TOUR DE FRANCE ARRIVES IN BERGERAC ! 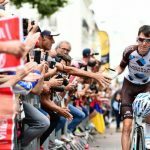 The tour de France makes stopover in the Dordogne this Tuesday July 11, 2017. Indeed the day after a day of rest, the 10th stage will leave from Périgueux with an arrival in Bergerac.